Now that the ruins and level one of Erdea Manor are stocked, it’s time to explore what lies below the surface. This level of Erdea Manor is even more divided into the secret area and the main level. But in addition to the secret crypts on the lower-right, there is a series of secret passages and rooms linking many of the areas in the main part of the level with a secret “sub level” that is made up of rooms 38, 39 and 40 and the passages linking them. 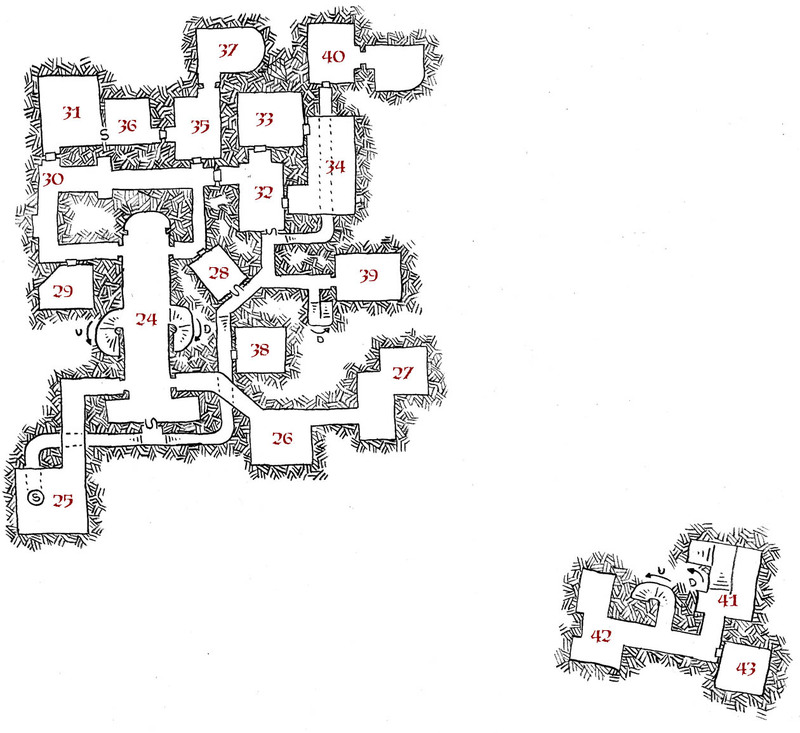 From these rooms, people can move about the level to keep up with adventurers for observation or sabotage (or in order to make a hasty escape). While drawing this level I was inspired by the description of the castle in the Assassin’s trilogy by Robin Hobb – I wanted passages that lead to many of the rooms of the level so the resident assassin could maneuver his way around the dungeon without being seen and also being able to oversee and overhear just about everything going on here. I’ll start stocking this level over the course of this week. The map was drawn in HB (#2) pencil on plain white paper (without a guide grid, as you can probably tell from the wobbly walls and some awkwardness in area 30), then scanned with XANE and contrast-enhanced in the Gimp. Hey Dyson I popped in to let you know you were a winner for a print copy of Blackmarsh. Let me know where you would like me to send it. I’ve included my email here. And the Erdea Manor map looks very cool. But all your maps do. Question–are you going to make a full PDF of this place? It certainly deserves a proper write-up. Probably when it is done – I’ll make it into a full module with background, rumours, wandering monsters and the rest of the goodies. Pingback: Maybe I Will Post Today After All. | Think You Used Enough Dynamite There?